Irene Odom Worrell, 86, passed away peacefully on Tuesday, March 26, 2019 at the SECU Hospice House in Smithfield surrounded by her family. Irene was born in Nash County on August 20, 1932 to the late Lennox and Emily Stroud Odom. She was married for 65 years to the late Joseph Harold Worrell, Sr. who preceded her in death on August 13, 2015. Irene was a godly woman who loved the Lord and her family and set an example for her children, grandchildren and great-grandchildren that will lead them all their lives. She was attending The First Pentecostal Holiness Church. Along with her late husband, Irene delivered newspapers for the News and Observer and the Goldsboro News-Argus for 25 years. 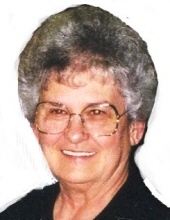 The family will receive friends on Saturday, March 30, 2019 from 1:00 – 2:00 p.m. at Seymour Funeral Home followed by a service to celebrate her life at 2:00 p.m. in the chapel with Rev. Cory Jackson and Rev. Bill Rose officiating. Interment will follow in Wayne Memorial Park. Irene is survived by her children, Joe Worrell Jr. and wife Debra, Steve Worrell and wife Karen, and Teresa Kohnen and husband David; grandchildren, Jason Worrell and wife Maya, Nancy Flinn and husband Sean, Kimberly Tannenbaum and husband Colton, Stephanie Worrell, Tyler Worrell, Brandon Kohnen, Heath Kohnen, and Morgan Kohnen; and six great-grandchildren. She is also survived by her brother, Kenneth Capps and wife Betty Carol; a niece, Molly Ann Birth; and several other nieces and nephews she loved very much. In addition to her husband and parents, she was preceded in death by her infant son, Joseph Lawrence Worrell; and brother, Gray Capps. To send flowers or a remembrance gift to the family of Irene Odom Worrell, please visit our Tribute Store. "Email Address" would like to share the life celebration of Irene Odom Worrell. Click on the "link" to go to share a favorite memory or leave a condolence message for the family.